Never before has there been so much talk about a memo in Washington. The top Democrat on the U.S. House of Representatives Intelligence Committee said on Wednesday a memo by the panel’s Republicans opens the door for the White House to fire the special counsel probing Russia’s alleged meddling in the U.S. election or the No. 2 official at the Justice Department. “It … increases the risk of a constitutional crisis by setting the stage for subsequent actions by the White House to fire (Special Counsel Robert) Mueller or, as now seems more likely, Deputy Attorney General Rod J. Rosenstein,” Representative Adam Schiff said in an opinion piece in the Washington Post. But if this memo is as damning as some believe that it will be, getting fired will not be the end of the story for many of these top officials. If it is true that government surveillance powers were illegally used to target Donald Trump and his associates, and if it is true that the Obama administration, the FBI and the Clinton campaign illegally colluded in a desperate attempt to destroy Donald Trump, we should be seeing a lot of really big names go to prison. It is absolutely imperative that the American people be given the opportunity to see this memo. I believe that this memo has the potential to end the investigation that has haunted the president for nearly his entire time in the White House, and I believe that this memo also has the potential to throw the Democratic Party into a complete state of disarray. 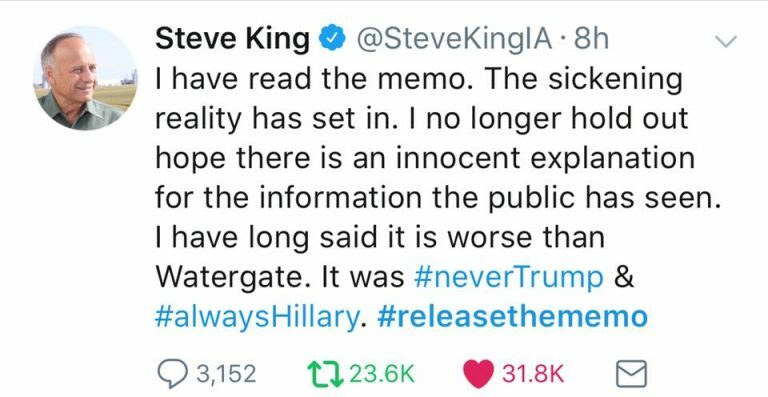 Personally, I have been very vocal about the need to release this memo, and I don’t know why any of my opponents don’t seem to want to speak out publicly about this. Maybe they have been and I have just not seen it yet. So if any of you know of any public statements by my opponents on this matter please let me know. As I stated during the recent candidate debate, I am not going to shy away from the hard issues, and that definitely sets our campaign apart from the exceedingly bland campaigns of my opponents. Because this memo could potentially end the Special Counsel’s investigation, it would definitely make sense for Trump to release it. And because this memo could be such a disaster for Democrats, it also makes sense why they are vehemently opposing any effort to make it public. We shouldn’t be too optimistic until we actually get to see the memo, but many are hoping that this could be the trigger that leads to a true “draining of the swamp” in Washington. The rule of law should apply to everyone, and that includes our elected officials. It appears that there has been a great deal of malfeasance going on behind the scenes, and it will be a great win for the American people if we can start to expose it for all the world to see.